RedLaser, the barcode scanning mobile app that eBay acquired from Occipital in June 2010, is nearing a significant milestone—nine million total downloads of its iPhone and Android apps. That’s up from 2 million downloads at the time of the acquisitions, which is nearly a 350% increase in downloads. RedLaser’s barcode scanning technology allows users to comparison shop on the go. Anyone can scan a barcode on an item at a store and then automatically access any eBay listings and local availability (courtesy of Milo) of the product on the marketplace. Sellers can also use the scanning technology to scan and item and list the product in very little time. 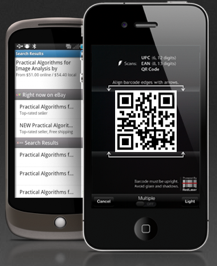 RedLaser’s technology was also integrated into eBay’s dedicated iPhone and Android apps. eBay also added QR Code scanning to RedLaser last Fall, and the apps are currently seeing 4,000 Quick Response code scans per day. eBay says that more than half of RedLaser scans are in the U.S., followed by the U.K. at 20 percent. And the top five U.S. regions using RedLaser are New York City, New Jersey, Los Angeles, San Francisco Bay Area and Houston. Additionally, RedLaser licenses its barcode scanning technology, and eBay is reporting that RedLaser licensees has doubled to 150 since June 2010 and includes Coupons.com, The Knot and Shopkick. For eBay, mobile has been a huge strategy and the company is revealing that all of its family of apps (including eBay, RedLaser, Half.com and more) have seen more than 33 million combined app downloads.